If you are an evangelical who has drawn closer to Christ through observing Lent, then perhaps this resource is for you. This FREE resource is only available for a limited-time. In the calendar of the Christian year, Easter always comes a few months after Christmas. We are told that the earliest possible date for Easter is March 22 and the latest is April 25. That means Lent (the six and a half weeks of spiritual preparation leading to Good Friday and Easter) could begin as early as February 4 or as late as March 10. Some years Lent starts in the dead of winter. Other years it begins closer to springtime. It is good that Christmas and Easter are not far apart because we cannot understand one without the other. If Christmas tells us why Jesus came, then Easter tells us he fully accomplished his mission. In between those two events we have the whole life of Christ. 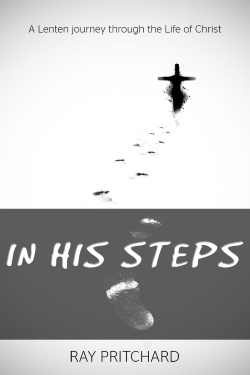 That’s our focus as we walk “In His Steps.” Between now and Easter we will cover many of the places Jesus visited while he was on the earth. I hope in taking this journey together, we will come to know Christ better and to love him more. The forty-seven devotionals take us from Ash Wednesday all the way to Easter. Since the dates of Lent change each year, we have numbered the days so this devotional will fit during any Lenten season.